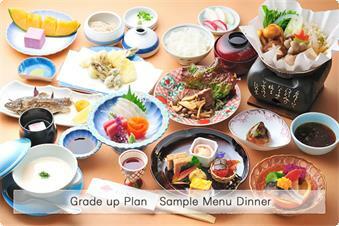 It is a 16-course menu that starts with appetizer and ends with dessert. We use local and seasonal ingredients we gather from the mountains, village and rivers. At Bouzantei Kotobuki, we grow summer vegetables and only use locally-grown vegetables. 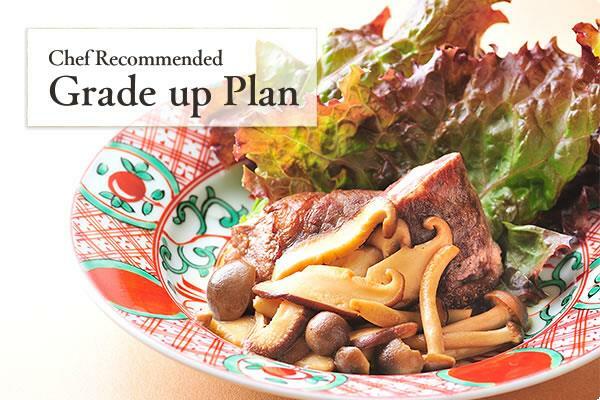 The chef picks bamboo shoots, mushrooms and wild vegetables in the mountains, while the hotel owner fishes freshwater fishes from local rivers. Dinner time starts at either 18:00 or 18:30. 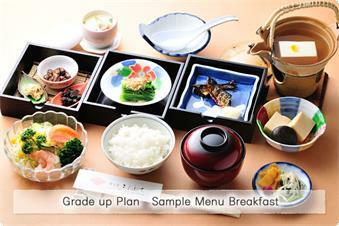 Japanese traditional course menu that consists of 12 dishes, including grilled fish as the main dish, steamed rice and miso soup. We especially would like you to try our “Niyakko”, for which we add bittern to soy milk shipped from Kyoto before steaming it. We hope that you enjoy the smooth texture. Breakfast time starts at either 8:00 or 8:30. The temperature of 100% pure spring water used in the common bath on the first floor is kept between 41-42℃. While it may feel lukewarm at first, many guests have said that it warmed them up from the inside and made them sweat. Our spring water has been long known for its treatment effects as well. If you prefer hot water, you can use the open-air bath on the rooftop. Ingredients may vary depending on the availability. We don’t take credit card. Thank you very much for your understanding. Cash deposit may be required depending on the time of the year. When it is, you will be requested to send us 10,000 yen per group by registered mail. Please see the “Reservation” page for more information. Please make sure to check in on time before we start preparing dinner. We only answer your questions regarding your reservation by phone (we don’t take questions by email). We are very sorry, but we are not taking child guests. We apologize for your inconvenience.